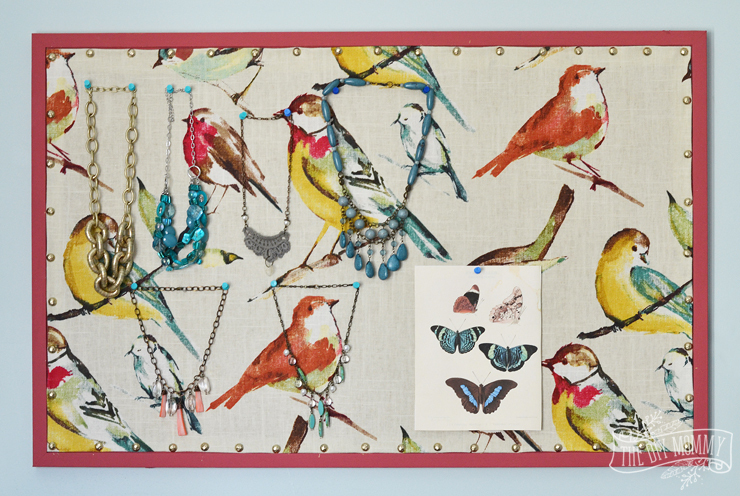 Bulletin boards are such a handy thing to have around the home – especially in a home office! 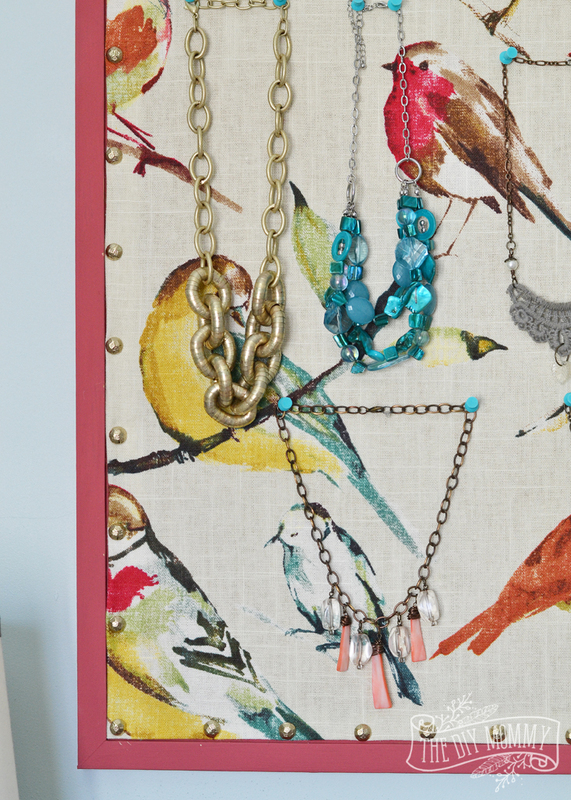 I had a boring old bulletin board in my craft room office that was begging for a makeover. With the help of some gorgeous fabric from OnlineFabricStore.net, some paint and some brass upholstery tacks, I easily turned it into a beautiful fabric-covered bulletin board that looks like a lovely piece of art on my wall! 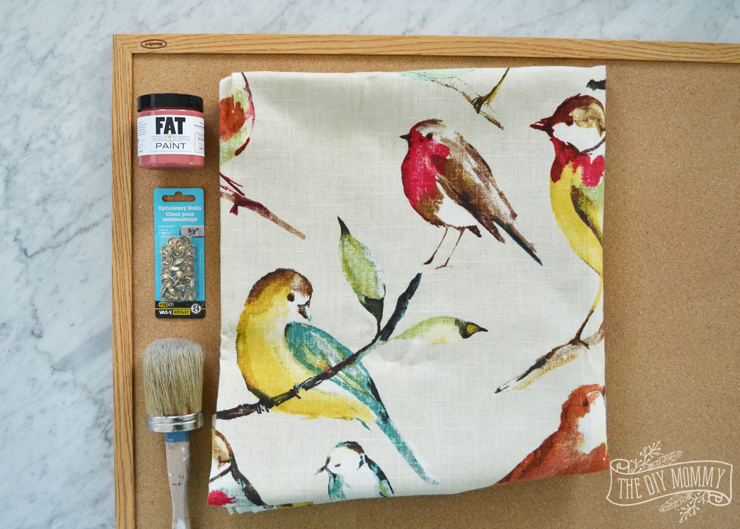 Here’s how to make your own fabric covered bulletin board. 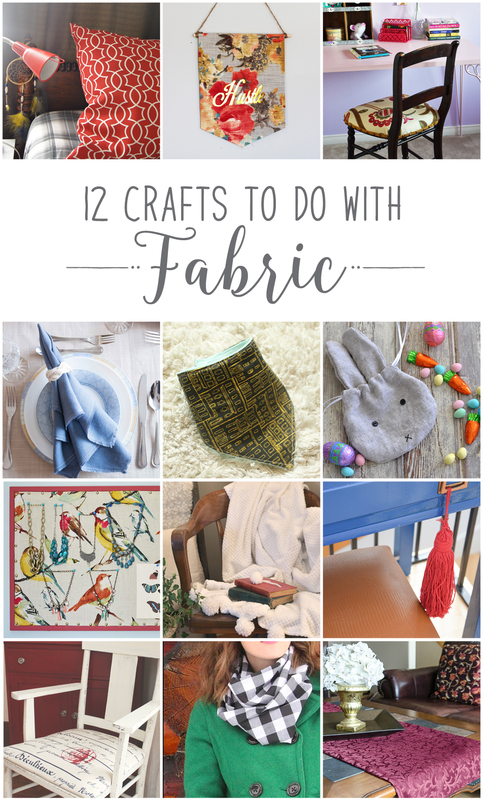 Make sure you scroll down to the end of this post to see 11 more fantastic crafts to make with fabric from my Canadian blogging friends. 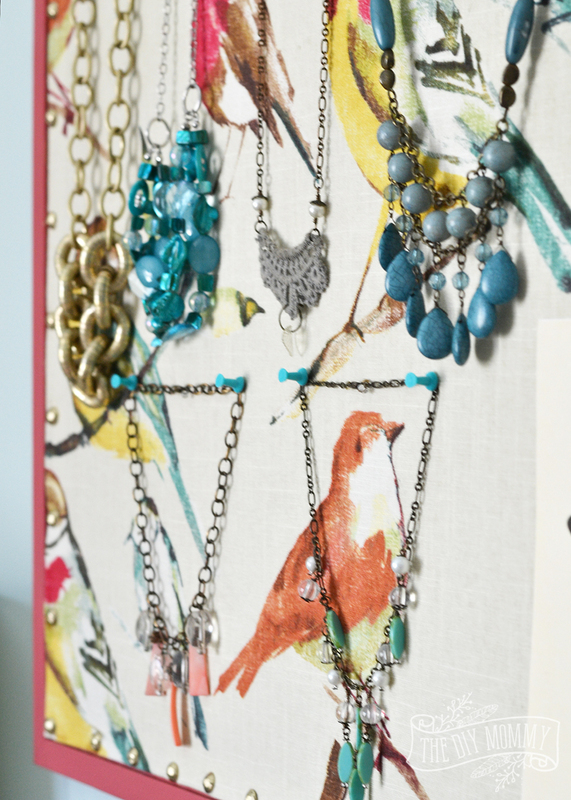 This bulletin board will be in my craft room office as a place to hang up inspiring photos or important documents, but I also love it as it’s displayed here – a place to store my favourite necklaces and art work! Paint the wooden frame with a couple coats of paint. Don’t worry if the paint gets on the cork board as this will be covered up later with fabric. 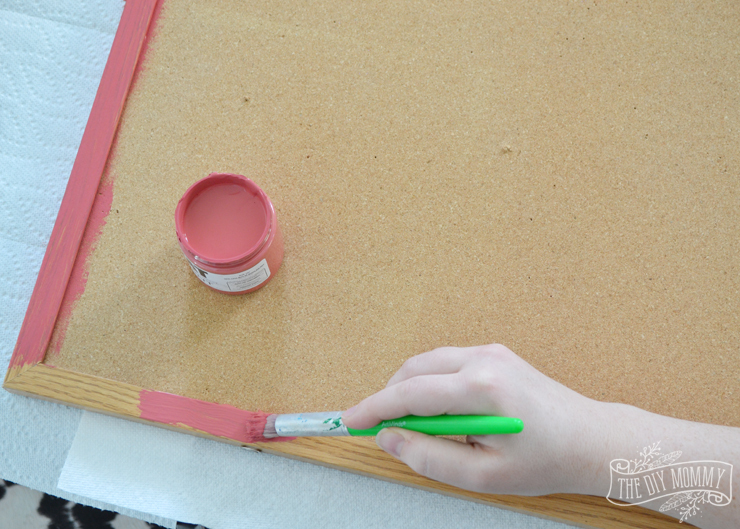 Cut a piece of fabric that’s 2 inches wider and 2 inches longer than the cork board part of your bulletin board. 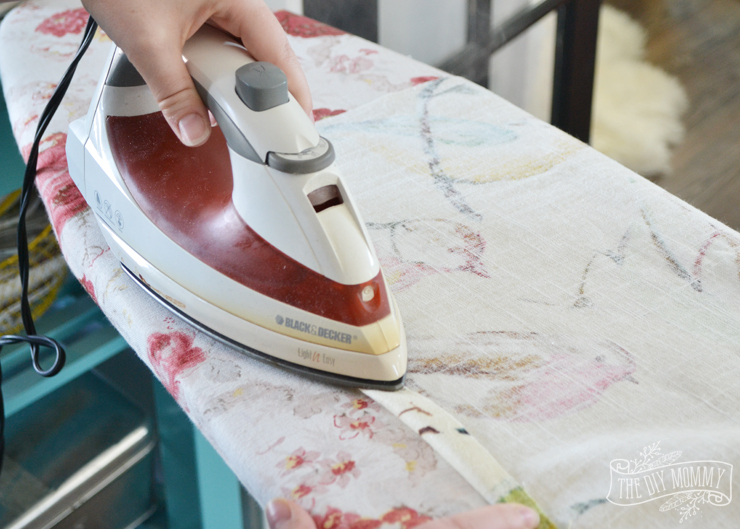 Fold all of the fabric edges over 1 inch to the back side of the fabric and press. Place the fabric onto the bulletin board right-side-up. 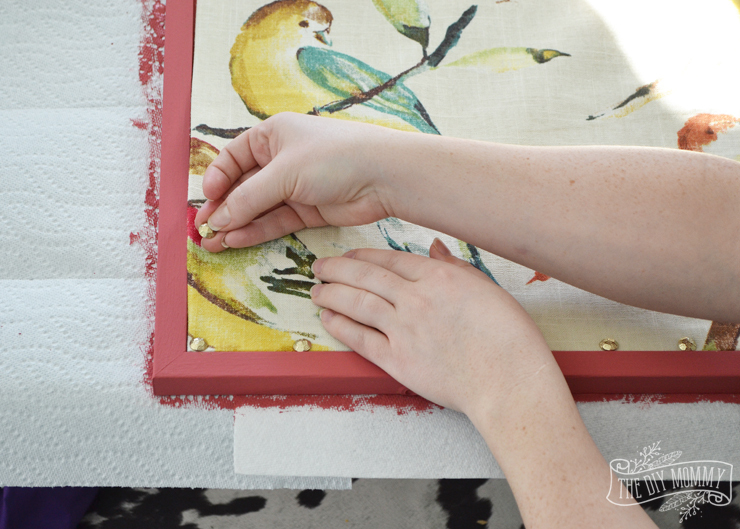 Push one upholstery tack through the fabric and the bulletin board on one corner, aligning the fabric to the inside of the frame. Then, pull the fabric gently and secure the opposite corner with a tack. If there’s excess fabric, fold it and tuck it further underneath. Repeat this process with all four corners of the fabric. Next, tack the centers of the fabric to the bulletin board. 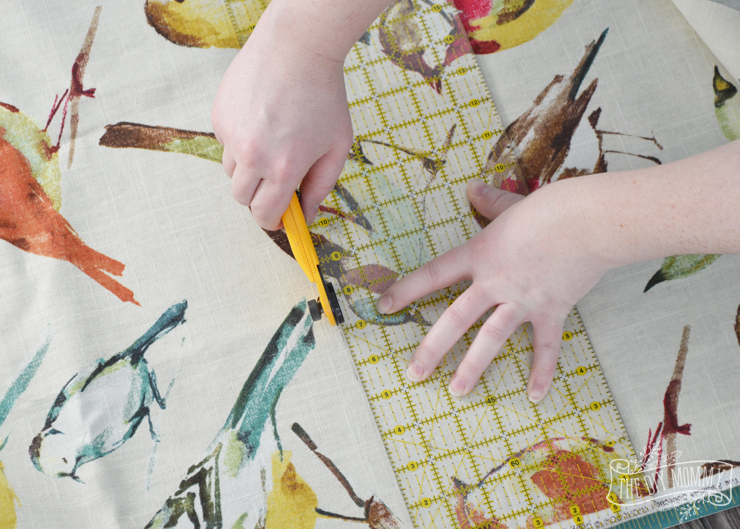 Then fill in the rest of the fabric’s edges with tacks. You can use a ruler to make sure the tacks are an equal distance apart, or just eyeball it like I did. That’s it! Your beautiful new bulletin board is ready to hang and enjoy. I love how this fabric looks like it’s a watercolour painting. It looks like a happy piece of art on my wall. Are you on INSTAGRAM? 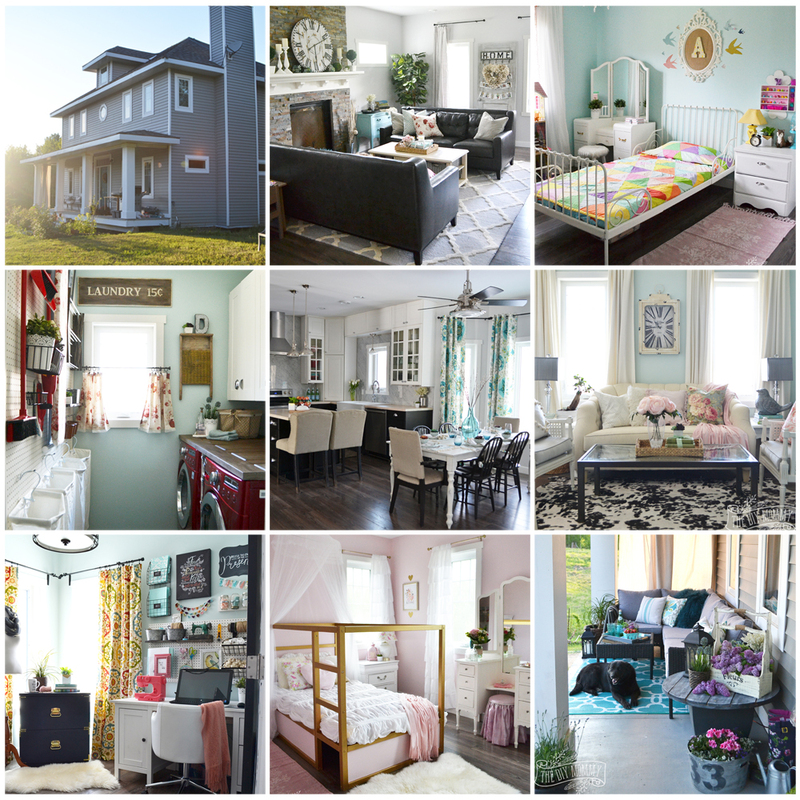 Make sure to follow me there to see how YOU can be involved in our #12MonthsofDIY series this year! I’d love to see what you create! What a lovely pattern! I love the details on the birds. 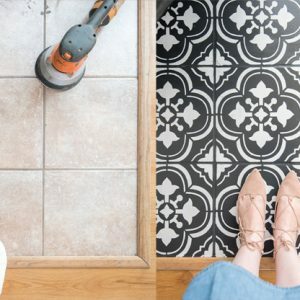 Great idea for a project too! Much nicer than just plain old cork. Fantastic pattern! Love it, and love this idea! Why not make a bulletin board pretty?! Love the idea, love the fabric and love how it turned out. Very clever way to ‘freshen up’ an older bulletin board. This looks so fresh and reminds me of Spring! It’s a great use of your material and what a wonderful way to add style to a boring bulletin board. What a great project, turned out great. 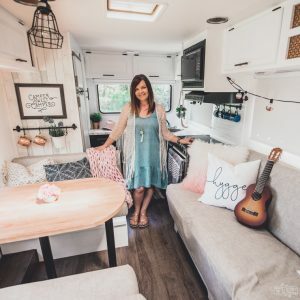 Love the fabric, and the pillow you made too -so pretty!